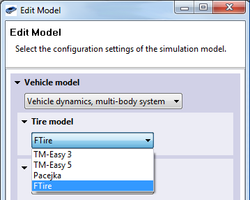 DYNA4 as real-time vehicle simulation environment offers a number of handling tire models. In some cases a high resolution contact patch and tire forces are desired. For such applications the FTire model has been made available in DYNA4. 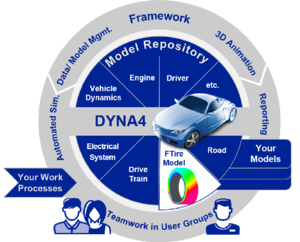 This allows for high accuracy NVH simulations to be performed while making use of DYNA4’s framework features, precise vehicle dynamics, and extendable axle models. Engineers get a powerful tool to work on ECU development and vehicle components. Proven models for vehicle system simulation with a track record of applications in design, testing, calibration, and verification of vehicle control systems (e.g., ABS, ESP, 4WD control systems, active front steering in SIL and HIL setups). Real-time capable multibody axle models, with hardpoint definition for detailed analysis of the axle design, offer an adequate level of detail together with the FTire model. DYNA4 comes with a library of common suspension types including bushings and up to 30 DoF per axle. Large choice of component models make development of different model configurations easy (e.g., conventional drivetrain and its hybrid drivetrain variant). TESIS DYNAware’s proven real-time model library can be extended as required by your own models.